Tomorrow night, Saturday 27th of December, I’ve been given the honor of joining Nick Mason on his last night ever of hosting on 90.7 Syn FM. I’ve been invited to co-host The Guilty Pleasure Surrender Hour at 7pm, but WHO KNOWS? I may just turn up early and pop my head in from 6pm, just so I don’t miss out on such a momentous event. So, my second biggest highlight of 2014 (after the birth of my son, of course) was being invited to join Bruce Otter and Larry King on their podcast, The Media Montage Hour, as well as Nick Mason on his radio shows Pre-Apocalypse and The Guilty Pleasure Surrender Hour. Such an honour for anyone to think I’ve got something worth saying so thank you, guys. 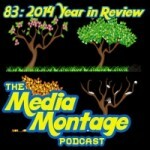 But what better way to reflect this than the latest Media Montage Podcast! Episode 83 is called 2014 Year in Review with Larry and Bruce inviting me on to discuss some of our highlights of the past year. As always, I had a ball chewing the fat with these blokes. Look forward to doing it again soon! Last week I had the best time with my sister, Mit, on Nick Mason’s radio hit The Guilty Pleasure Surrender Hour. Airways are definitely not constricted at this stage! Just had a ripper of a time on Nick Mason’s show, The Guilty Pleasure Surrender Hour, with my little sister Mietta playing some of the tracks we’d normally be too guilty to get caught listening to in public. BUT the radio shows don’t end there; unsure how much I can discuss as I’m not sure of the air date, but I will be recording shortly for the Media Montage Podcast hosted by Bruce Otter and Larry King. Can’t wait to get back in touch with them after a conversation I really enjoyed last month. Stay tuned for the podcast upload date! Invited back by radio host extraordinaire, Nick Mason, for his show THE GUILTY PLEASURE SURRENDER HOUR. Tune in at 6pm this saturday the 6th of December to hear Nick, myself, and my wee little sister, Mietta, play and discuss the music we LOVE to listen to whilst HATING ourselves that little bit for listening to it in the first place. 90.7 SYN FM for citizens of Melbourne Australia. For all the rest, stream it from http://syn.org.au/or wait for the podcast! *Something mixed by some Brits about a handful of people in a leaky boat who are going to save the world.